In Bernanke's view the solution for the savings glut is: "to try to reverse the various policies that generate the savings glut—for example, working to free up international capital flows and to reduce interventions in foreign exchange markets for the purpose of gaining trade advantage." This would, presumably, move the investment schedule and lead to a recovery. [...] "unless the whole world is in the grip of secular stagnation, at some point attractive investment opportunities abroad will reappear. If that’s so, then any tendency to secular stagnation in the US alone should be mitigated or eliminated by foreign investment and trade. Profitable foreign investments generate capital income (and thus spending) at home; and the associated capital outflows should weaken the dollar, promoting exports. At least in principle, foreign investment and strong export performance can compensate for weak demand at home." "Successful policy approaches to a global tendency towards excess saving and stagnation will involve not only stimulating public and private investment but will also involve encouraging countries with excess saving to reduce their saving or increase their investment. Policies that seek to stimulate demand through exchange rate changes are a zero-sum game, as demand gained in one place will be lost in another." ** And there are too many problems with the excess savings story to discuss here. The investment schedule and the very existence of a natural rate of interest, negative or otherwise, is plagued by logical problems and by the complete lack of empirical evidence, since investment really reacts to changes in the level of activity (accelerator). Also, the notion that intertemporal decisions govern consumption behavior is not without its problems. 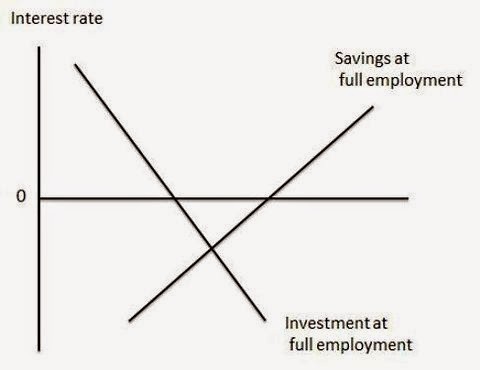 That's why Keynes tried to abandon the loanable funds theory and developed effective demand, in which income adjusted for differences between investment and savings. I had in mind this paper by Menzie Chinn http://www.ssc.wisc.edu/~mchinn/IF_tradedeficit.pdf. I should say that I did research on that back in the 1990s for Wynne Godley, and part of that is in my PhD dissertation. Note that, imports in particular, do not react to changes in the exchange rate, and the differential between income elasticities of exports and imports, the so-called Houthakker and Magee effect, implies that changes in income dominate the adjustment of the current account.